Crews from two different states responded to an apartment fire that injured five firefighters in Berwick, Maine Friday. 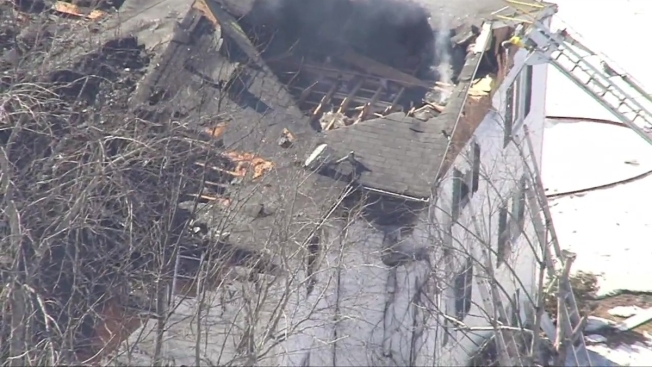 A Maine firefighter has died from injuries sustained while battling a blaze at an apartment building in Berwick. The fire started at a multi-family home at 10 Bell St. just before 11 a.m. Friday. Maine Public Safety Spokesman Steve McCausland says Capt. Joel Barnes was one of two firefighters who encountered a wall of flames on the third floor and had to be rescued. Barnes and four other firefighters were taken to an area hospital for treatment. Barnes later died from his injuries. "Obviously, you can see this was a difficult situation, for all of the fire departments that responded to this event," said Maine Fire Marshal Joe Thomas. "When we lose one of our own, it's a difficult time." Authorities said crews from 16 fire departments in Maine and New Hampshire remained on still into the afternoon battling the blaze.